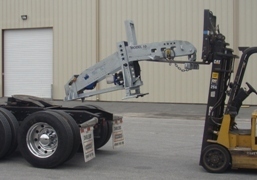 The New Model 10 5th Wheel Tow Hitch converts any standard fifthwheel road tractor for towing service at a moments notice. 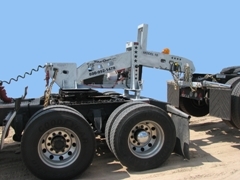 This heavy duty wrecker unit is built strong and built to last. 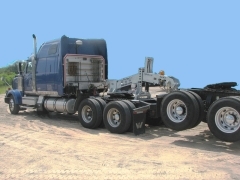 Tow semi tractors, straight trucks, buses and other towable equipment. 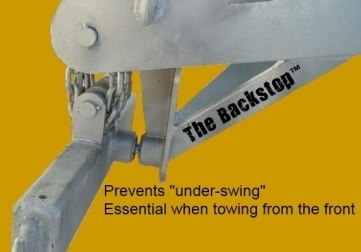 Reduce towing expense. Enjoy in house towing service on demand. Keep customers satisfied by swapping out tractors in case of unscheduled delays, therefore keeping promised deliveries on time. Save big by bringing disabled units home for quality repairs you can afford. 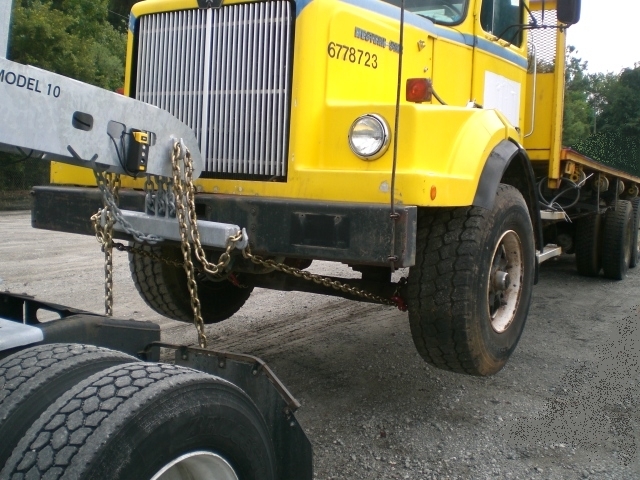 Safety is paramount with heavy duty towing and this unit really delivers. Voted #1 for safety and stability. The three point attachment system from the boom to the sling pulls true and steady with no side to side swaying. 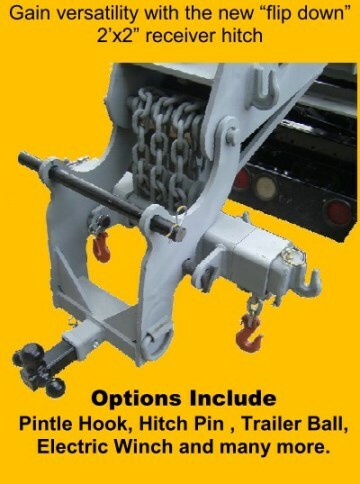 Our 3 point attachment system consists of three 1/2 inch grade 70 chains in a triple endless basket sling configuration. Each of the three loops has a WLL (working load limit) of 22,600lbs. You have 3 fully rated chains wrapped around 2 cold rolled steel pins for a total WLL of 67,800lbs between the boom and the towed vehicle. Also standard with every unit is an air brake safety assembly which allows you to provide critical air brake actuation to the towed vehicle. A must have for safety on wet roads and where sudden stops occur. No complicated setups. The boom is a fixed position system. This design ensures you will always have adequate reach for a safe turning radius on any standard fifth wheel tractor. 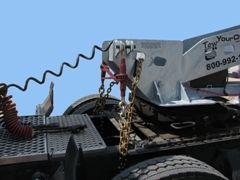 The newly designed ratchet tie down safety system and safety chains are included standard on every Model 10. Two 1/2 inch ratchet binders are permanently mounted to the frame and a handy built in storage compartment conveniently stores the safety chain. This convenient setup ensures the use of this important safety feature. The Model 10 is hot dip galvanized. Galvanizing is a process that has long been an industry standard finish for steel products exposed to the rigors of the road. 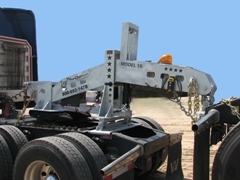 Boat trailers which are consistently dunked in salt water typically are galvanized due to the unique durability of this finish. It is our opinion that this is the only suitable finish for a product such as a fifthwheel wrecker. Think about the environment to which this unit is going to be exposed. This unit will be living in a swirling cloud of road moisture and salts which will penetrate every inch of the fifth wheel wrecker. A galvanized finish will not allow rust to compromise the integrity of the steel that is the backbone of this money saving machine. This unit will never rust from the inside out. We recognize what you want is a finish that will stand up to the rigors of the environment it will be living in. Thus providing you many years of dependable, maintenance free service while protecting the structural integrity of your investment. Hookups are fast and easy to perform. With hundreds of units on the road here in the US and abroad this unit has proven itself not only safe and dependable but a wise investment that pays for itself in a very short period of time. * Safe stable towing with no side to side swaying. Installation is a easy and only takes a few minutes. Integral angle iron is inserted into precut slots for forklift installation or you can use the heavy duty center weight mounted D ring for lifting with an overhead hoist.